→ Balance is a key element of a → happy life and → sustainable business . When your → Life or → Business is out of balance, nothing works. the whole, i.e. organizational needs, and the parts, be they large (functions) or small (teams or individuals). You must require that your individual players forgo the quest for personal best in concert with the group effort. We all start our careers as specialists – men and women with narrow corridors of functional expertise. The goal of specialists is to optimize individual effort. But, according to Mark Stevens, the author of Extreme Management, "to raise to the ranks of senior management, you must build cross-functional expertise and forgo this quest for personal perfection, seeking instead to balance the skills and capabilities of the specialists working for you." 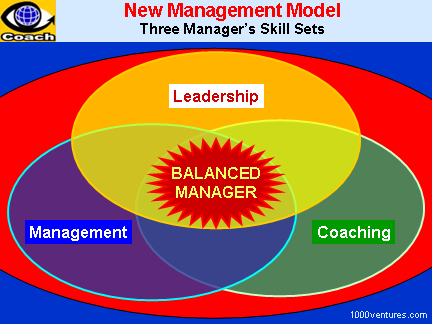 Effective managerial leadership demands a delicate balance between sensitivity and authority, between the whole and the parts, between loose and tight leadership style, between functional expertise (depth of knowledge) and cross-functional excellence (width of knowledge), internal (creating value for organization and employees) and external (creating value for investors, → customers , and society as a whole). It also demands balancing the art and science of management as well as innovation and tradition. Effective leadership demands a delicate balance between laissez-faire and overly controlling styles.